April 10, 2014 by The Junkie 6 comments on "Japanese in Real Life: How To Use The Aircon Remote & Understand Kanji." 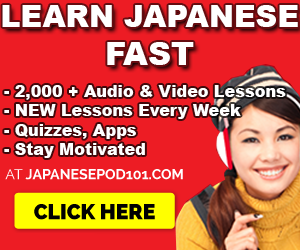 The best way to learn Japanese? Out of necessity. Especially if you’re sitting at home and freezing because you can’t figure out your Japanese air-conditioner. 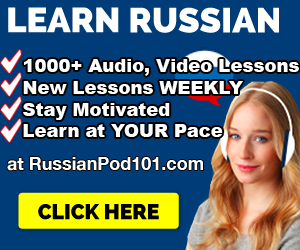 Learn Japanese or die, baby. I’ll guide you through. It’s worse than Japanese toilets, and Japanese toilets are pretty DAMN awesome. Perhaps I’m making a bad comparison here. But anyways, you should call it an aircon, spelled エアコン in Katakana. It has all these buttons on there and all you’re hoping for is “HOT,” “COLD” and “INTENSITY,” right? Too bad. They decided to latch on more features. 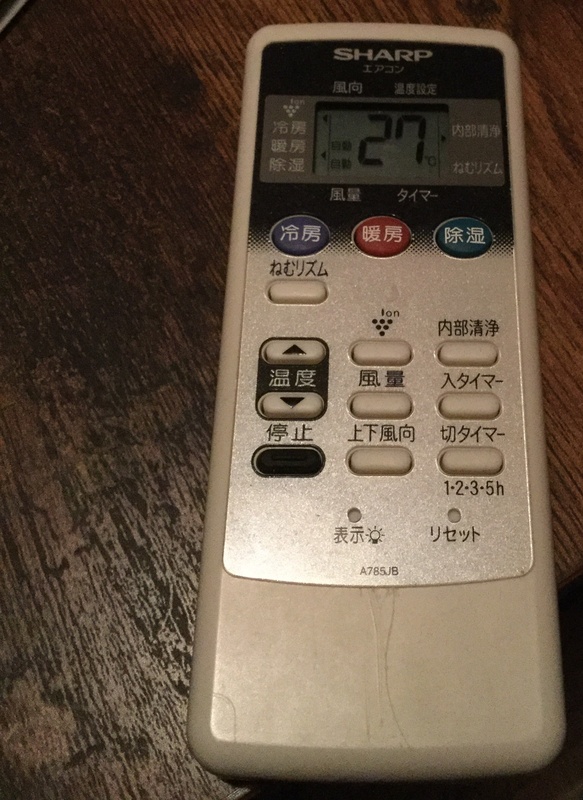 So, let’s translate the Japanese aircon remote kanji and learn some Japanese in the process. By the way, the remote control is called リモコン. And here’s a spiffy looking picture of my Daikin remote control. So, the top says 設定温度 (せっていおんど) meaning “setup temperature” or your set temperature. I’m stayin’ nice and hot with 30 degrees Celsius. Of course, this リモコン is loaded with all kinds of functions. Oh, functions! You’ll need to know that in Japanese. 自動 : (jidou) Automatic mode. I have no idea how or why and what is automatic. ドライ : (dorai) Meaning dry. It’s a cool breeze. I have no idea why it’s dry though. 冷房 : (reibou) Meaning “cooling” or “Air conditioning.” Use it for cold air. 暖房 : (danbou) Meaning “heating.” Use this to warm your room up. 送風 : (soufuu) Just the fan. 風向 : (ふうこう) meaning “wind direction” or where your AC is blowing. 風量 : (ふうりょう) meaning “wind speed” or how much air you’re blasting right now. Now below the screen, above the big yellow button. 運転 : (うんてん) meaning “operation” but it actually just means “ON.” Turns the AC on. 停止 : (ていし) meaning “stoppage” or “halt” but it actually means “OFF.” Turns the AC off. And all those buttons below. 運転切替 (うんてんきりかえ) meaning “change operation.” Use this to switch from hot, cold, dry, fan, etc. 温度 (おんど) meaning “temperature.” Press this up or down to raise or lower the temperature. 風量 : (ふうりょう) meaning “wind speed” and uses to change the intensity of the air blown out. 快眠 : ( かいみん) means “pleasant sleep.” Correct me if I’m wrong but this setting reduces the temperature as you’re sleeping and raises it around the time you get up in order to ensure a pleasant sleep? Just works with the “cooling” setting. 風向 : (ふうこう) meaning “wind direction. Press it to adjust the direction of the AC air. 健康冷房 : (けんこうれいぼう) means “health cooling” but it’s designed to reduce the degree difference between the temperature outside and inside in case you’re sensitive to it. Yeah, I don’t get it either. 内部クリーン : (ないぶくりーん) means “inside clean.” This cleans your aircon from that mildew/moldy smell. You have to hold this button down a bit to make it work. 風ないス : (ふりないす）means “nice wind.” Basically, this feature avoids hitting you directly with air. In a cool setting, it aims “up” to envelope the whole room and a hot setting, it aims at the floor. I don’t know either. 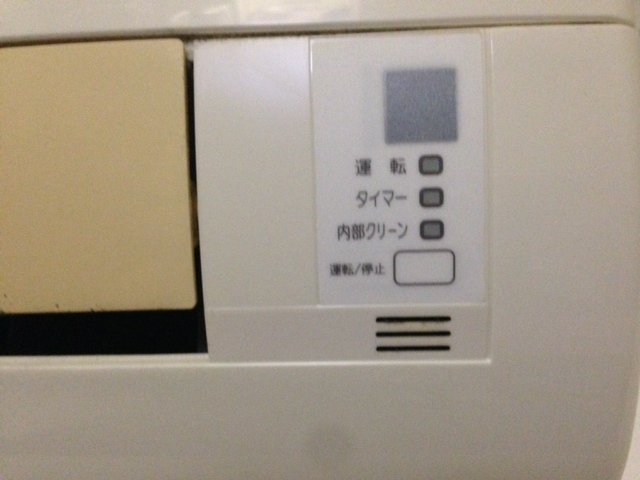 入タイマー :（いりたいまー）means “timer on” and used to set after how many hours you want the airconditioner to turn on. 切タイマー :（きりたいまー）means “timer off” and used to set after how many hours you want the airconditioner to turn off by itself. 取消 : (とりけし) means “cancel” and is used to cancel and delete your timer settings. Damn, I have a REALLY complicated Japanese air con remote. But hold on, there’s some more stuff written on the air con itself. 運転 : “Working” and will have a green light when turned on. タイマー: “Timer” and will have a green light when a timer is set. 内部クリーン: “Inside cleaning” and will have a green light when it’s in cleaning mode. 運転/停止 : The ON/OFF remote control sensor, I think. And there we go. Of course, I’m still clueless about the 健康冷房 and 快眠 features. 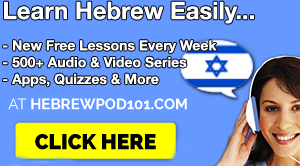 If you have a better idea, please leave a comment. I hope this saves you from freezing or overheating in Japan. It gets HOT in the summer. Drop a comment below and let me think. you’re welcome! just watch your electricity bill, haha! Hey thanks. Heater was perfect last night. I decided to turn it off. When I woke up, I can ‘t get it right any more. How does this work? 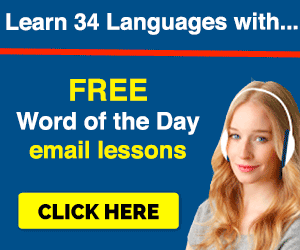 Previous Previous post: The Big Fat Master List of Japanese Particles. Part 2.